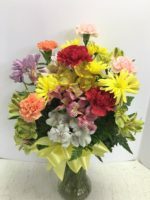 Designing Linear Lilies is a joy for us at Roadrunner Florist. 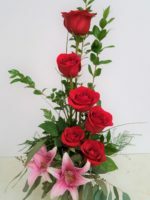 We choose the freshest lilies and create a stunning arrangement in a more modern style: Linear! Lilies are part of the genus Lilium, which is known as the group of “true lilies”. Though many other flowers use the word lily in their common name, they are not part of this genus (and therefore are not true lilies). 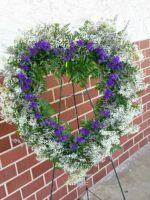 Examples include water lilies, calla lilies, daylilies. The lily is often associated with the story of Hera and Zeus, though the calla lily can be associated with this story as well. According to the myth, Zeus wanted baby Hercules to drink the milk of Hera, his wife. Because Hercules was born of another woman, Hera disagreed. Zeus brought Hercules to Hera to drink her milk while she was sleeping, but she awoke and pushed him away. The drops of milk that spilled on the ground grew into lilies. 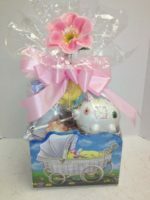 Lilies most commonly mean devotion or purity, though meaning can vary by type of lily, culture, and color. Because of the Greek myth of Hera and Zeus, lilies are associated with rebirth and motherhood. In China, lilies are used in weddings because they are tied to 100 years of love. They are also tied to good luck. Assyrians and Babylonians associated lilies with the goddess of fertility, Ishtar. Christians associated lilies, especially Madonna lilies, with the Virgin Mary. Lilies commonly grow in white, yellow, pink, red, and orange. 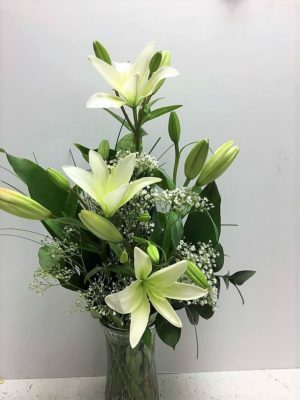 White lilies symbolize purity and virtue. 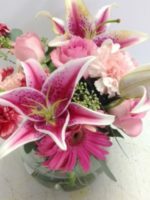 Pink (stargazer) lilies symbolize prosperity and abundance. 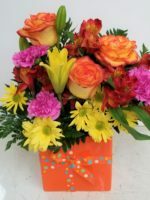 Orange (tiger) lilies symbolize confidence, pride, and wealth. Yellow lilies symbolizes thankfulness and desire for enjoyment. 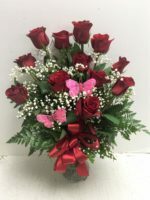 Choosing our Linear Lilies is a true expression of love. 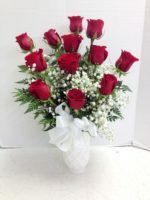 You might prefer our Stunning White Lilies or Dozen Red Roses and Lilies.